My last festival event last night - DJ Spooky with his re-/de-construction (he says remixing) of D.W. Griffiths' Birth of a Nation, 1915, Rebirth of a Nation. 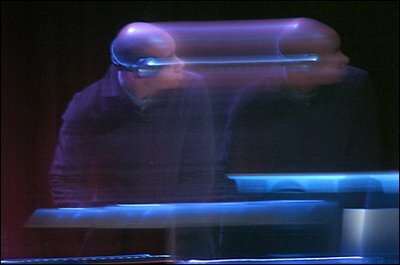 He's a bit cool, old DJ Spooky (that subliminal kid). His wry intellect comes across whenever he speaks. He has these smiling eyes that have that laughing look like the Dalai Llama. Like he's found his place in the world. Maybe I read too much into people. I dunno. But I think he looks he knows what he is about, in a general sense. If he does, then he is a lucky man. Anyways, the gig. It was brilliant. He had three screens - one main one and two slightly smaller ones on either side. The two side ones were generally showing the same image although not always in sync. He layered up the images and closed in on some, added filters, deconstructed, pixellated, slowed down, degraded, coloured, moved the time structures - all the things a DJ does with sound. (I'm interested in the way software approaches sound and image - I was thinking about this a while ago and the way Spooky remixed the film has brought me back to it. There's a similar approach and language with both sound and image on the computer. Getting rid of "noise"; layering; reversals; distortion; loops; adding filters; opacity; transparency; adjusting curves; overlays. I could go on.) Added to that, the soundtrack, mixed live, was wonderful. I had never seen the original film - depicts the rise of the Ku Klux Klan in the southern states of the US after the Civil War. It was a contentious film - the KKK shown as the heroes of the day. Very nasty stuff. I'd like to see the original. It starred the divine Lillian Gish. Here's an article about Rebirth of a Nation from the Harvard University Gazette. Interesting. Lindsay Davis, in today's DomPost, panned the show as being basically intellectually lightweight. I can't find that review online, but on Scoop, Lyndon Hood gives a much more favourable opinion. Interesting. I guess I could be classed as an intellectual lightweight myself, so there ya go! I actually don't see what he is doing in this area as trying to be an intellectual heavyweight anyway. Maybe in other areas (his writing, for example), but not in this particular moment. All comes down to opinions anyway, eh?